Well, it’s been emotional, as they say. In every sense of the word. Dismay? Oh yes. The incredibly long sentences – and all those semi-colons. When someone back in 1989 said the novel was reminiscent of Hardy, I thought it was a compliment – but it may well have been despair at the endless sentences, the dwelling on emotion, the feeling that one simply wanted to get hold of these characters and give them a good shaking! The last three weeks has been like living in a time-warp. Editing a 700-page novel, working late, not sleeping, going to bed after midnight, getting up again at 4 or 5 am because my characters were ‘bothering’ me – I’ve been doing all that, just like the old days. And what’s more, I’ve been alone for the past three weeks, too – my husband Peter has been away at sea, just as he was then. The most extraordinary part, though, has been getting to know my characters again. They were part of my life – through two big novels – for almost ten years, so they have remained in my memory like old friends. Ones who shared some tumultuous events, but have since dropped into the background. But meeting them again – oh, my goodness, that’s been very strange! But it wasn’t just the characters. There were technical faults that as a first-time novelist, I hadn’t been aware of. One mistake that I wouldn’t make now, involves ‘point of view’ – in any given scene, whose point of view are you taking? One chapter struck me as being so mixed up, I had to re-write it. But guess what? It lost all its tension. So it was back to the original, with just a few adjustments. And the lesson that maybe technical expertise isn’t all that’s required! To retain the emotion, retain the passion, I just had to go along with it. I had to remember that this novel was a bestseller in its day – and as I know from readers who have come to it recently, it remains an intensely powerful story. Set in late Victorian England, to be sure, but with themes as modern as today. So I settled for restructuring a lot of sentences (you can’t just remove semi-colons!) and toning down a few heated exchanges. (Not many.) I tightened up some descriptive passages, and got rid of some of the back-story which appeared in the first two pages. But after three weeks of living alone with these characters through 12 and 14 hour days, it’s been like revisiting the past. My past – their past – the characters themselves. I found myself so totally absorbed by their quandaries, their decisions, and the effects of those decisions, that I was, once more, living in their world. A 19th century world of grandeur and poverty, with many shades of grey (oh, yes!) in between. And I’ve been thinking, all the way through, that fans of Julian Fellowes’ DOWNTON ABBEY will certainly enjoy LOUISA ELLIOTT. It has all those elements and more. Through 700 pages, the experience for me has been rather like bringing up my children. Getting them through the troublesome teenage years, to a point of maturity where they’re ready to leave home. And by the end I was weeping. Really sobbing, because saying goodbye to Robert, Louisa and Edward, was like saying goodbye to my own family. I console myself with the thought that it won’t be for very long. Once LOUISA ELLIOTT is launched as an ebook, I’ll be preparing for another lengthy visit. (Or do I mean girding myself for more trouble?) Louisa, Edward and Robert will be bringing their children home to stay for another three weeks, so we’ll just have to see what happens then! LIAM’S STORY is the next project. Hope you have left some of your 30 year old “zing”, and not toned it down too much…………Love the honesty…….this brings the true emotions and feelings to life…………….. Thank you, Sam for your lovely comments. The book was originally edited by one of the best professionals in the business, and she was keen to keep the writing style. But as one grows older, the view changes! I hope you won’t be disappointed with the ebook version – it’s just a little crisper than before. Congratulations Ann. Can really relate to your feelings. Five minutes ago I finshed proofing the publisher’s edit of my Thames book; All Along the River . I can go off to my Melbourne Cup lunch today with a happy heart. Good luck with Liams’s Story, which sounds fascinating. Thanks Pauline – good to know I’m not alone in facing these mammoth editing tasks! Enjoy the Melbourne Cup – wish I was there! Look forward to reading the revised edition to see the changes and relife Louisa’s life. after a Master’s Tale a writer’s tale then love that gritty Yorkshire honesty in your work Ann so much a better read than the Bloomsbury set or whatever they are called nowadays long may you continue to have ink in your pen . . .
Bless you, Mike for that lovely compliment – I shall remember it, especially when editing! Absolutely loved this book in the first place. A lot of years have gone by since I first read Louisa Elliott, so I’m deffinitely ready to read it again. A perfect accompaniment to long dark nights by an open fire! Thanks, Simon – I think you’ll like the next project LIAM’S STORY even more. Seafaring connections, you see! I’ve never been able to get hold of a copy of this, have only read my sister’s. But as I now have an iPad I will eagerly await getting it as an eBook, and Liam’s Story too. I reread that one at least once a year, and my partner loves it too. I love back-story, it helps me know what drives the characters, I do hope you haven’t removed too much! I’ve replied privately Odille, so I hope you’re now reassured. Glad to hear you love LIAM’S STORY so much. Hope you enjoy the memoir too when it comes out. I am full of admiration – and not only for the sheer self discipline involved in writing a book in the first place. It is a very solitary occupation. To do re-writes and corrections – endlessly it seems. And THEN – e.book style must be observed – more self-discipline. More ink in your pen? That must be an understatement – I am thinking more along the lines of more wine in your glass – but then, I have NO self discipline! Can’t wait to re-read Louisa – and Liam’s Story, which is still a favourite. Many thanks, Anne – lovely to know that ‘Louisa’ and ‘Liam’ are still favourites. It’s almost time for the glass of wine, so I’ll drink your health! Hello Anne, I came to your blog through LinkedIn and enjoyed reading your experience as you transform your novels to e-books. Fascinating! I am a big fan of historical fiction and look forward to downloading. Best of luck. Thank you Patricia – if I didn’t reply before, then forgive me, it’s been a busy, busy time! I hope you enjoy Louisa’s journey. Thank you Diana – and all the best to you for Christmas and the New Year! I hope you enjoy LOUISA ELLIOTT when she appears. I read “Louisa Elliott” in 1989—got it from the public library in Plymouth, MI, USA! Little did I know then what a treasure I found! No books nowadays surpass those I read then! I enjoy re-reading all my favorite books. Coming in on the end of this discussion, WHEN is the e-book being released? How much longer must I wait? I have an iPad now and am looking forward to day that I can take “Louisa Elliott” wherever I go! 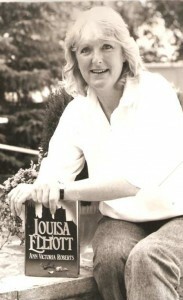 LOUISA ELLIOTT should be appearing very soon on Amazon – I hope you enjoy the new e-book version. I’ve moved house innumerable times, have thrown out many hundreds of books as I went but Louisa and Liam are with me still. I loved Louisa and adored Robert, for all his faults. It is still my favourite love story. I’m so pleased to have found your blogs.